Several years ago I posted a four-part discussion about permaculture and my concerns with the blend of philosophy, science and pseudoscience that it contains. (Here are links to Parts 1, 2, 3 and 4.) So I was pleased to be part of an Extension tour group that visited an established permaculture farm in the San Juan Islands earlier this spring. This gave me an opportunity to see whether there was any perceptible shift in the permaculture community towards practices based on applied plant and soil sciences. Specifically, I chose to look for invasive species identified as noxious weeds that many permaculturists cultivate rather than eradicate. Bamboo may not be a listed noxious weed in Washington State, but the yellow archangel beneath it is. Our spring came early this year, and the islands were blindingly yellow with the Scots broom that runs rampant there (and throughout the West). This species is a Class B listed noxious weed in Washington State and has been mandated for control by San Juan County. So I was surprised and disappointed to see it and other related broom species not only present at this farm but used actively as nitrogen fixing species. Other brooms were actively blooming and setting seed. 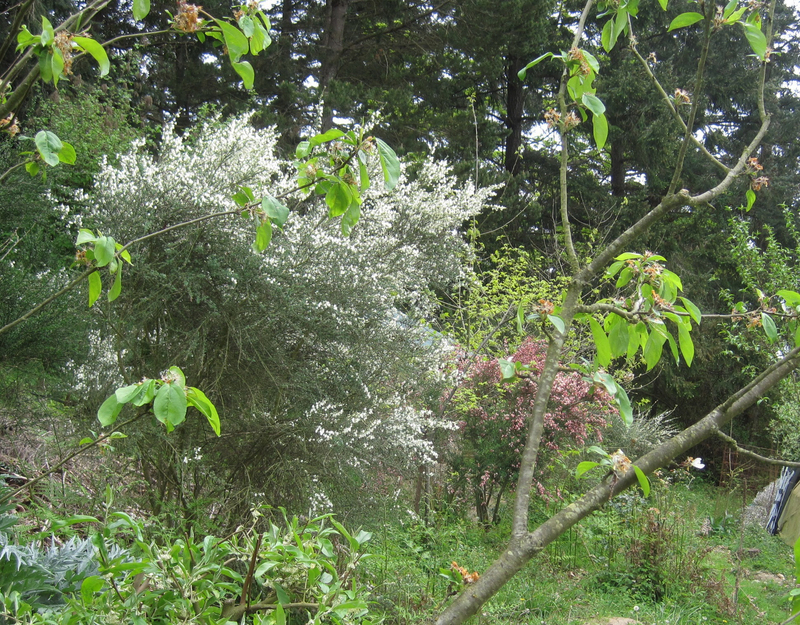 The practice here is to plant broom or some other nitrogen fixing species right next to a fruit tree as a “companion plant.” While the idea is logical, the choice of species is not. There are many other plants, including legumes and alders, which grow well in our area and would provide the same benefit. 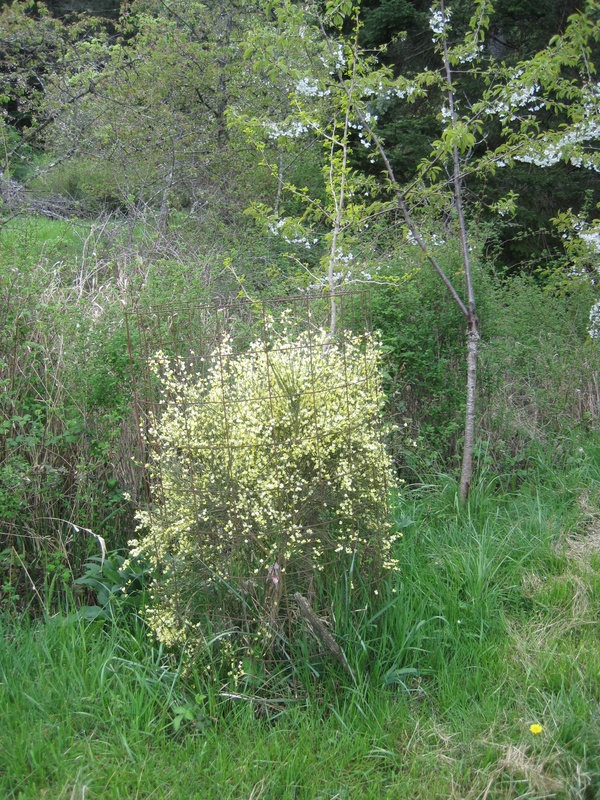 Scots broom (a class B listed noxious weed in Washington state) used as a “companion plant” for a fruit tree (both are encased in wire). There is nothing that can excuse the deliberate use of a listed noxious weed that’s mandated for control by local government. Permaculturists should endeavor to be good citizens and not infringe on the rights of their neighbors who don’t share their philosophy. 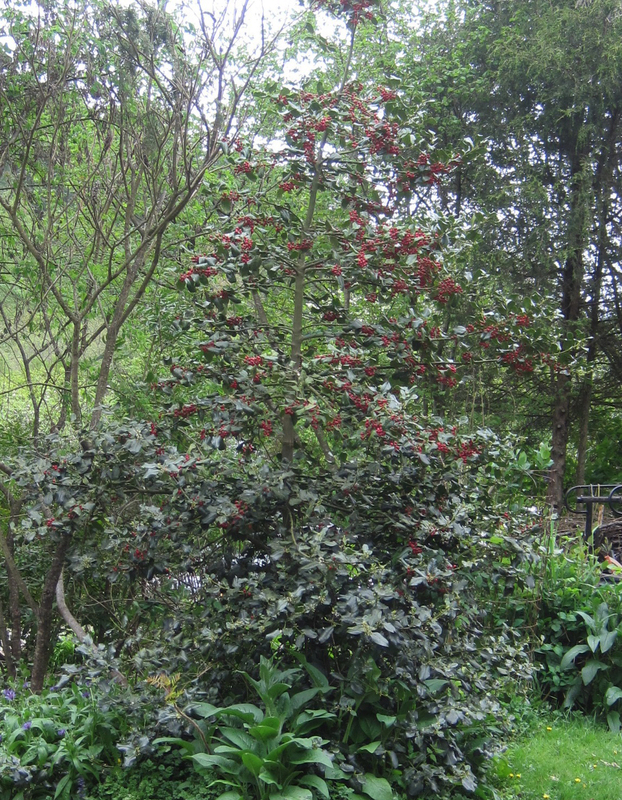 English holly is on the noxious weed monitor list for possible listing. Is “lasagna gardening” really worth the effort? This week I got a complimentary copy of Urban Farm, dedicated to “sustainable city living.” The cover story is Lasagna Giardino – follow this recipe for a lasagna garden that grows perfect plants – Italian or not. Double digging the soil 12″ isn’t necessary: we do it because it’s hard work, and we think we need to put elbow grease into the project. Making layers of noodles and sauce isn’t necessary: we do it because appeals to us -lasagna is a tasty comfort food. There’s a lot of damage that this “recipe” can cause. Double digging the soil 12″ destroys soils structure. Don’t do it. The layers of noodles and sauce (especially the sauce) can create an overload of plant nutrients. 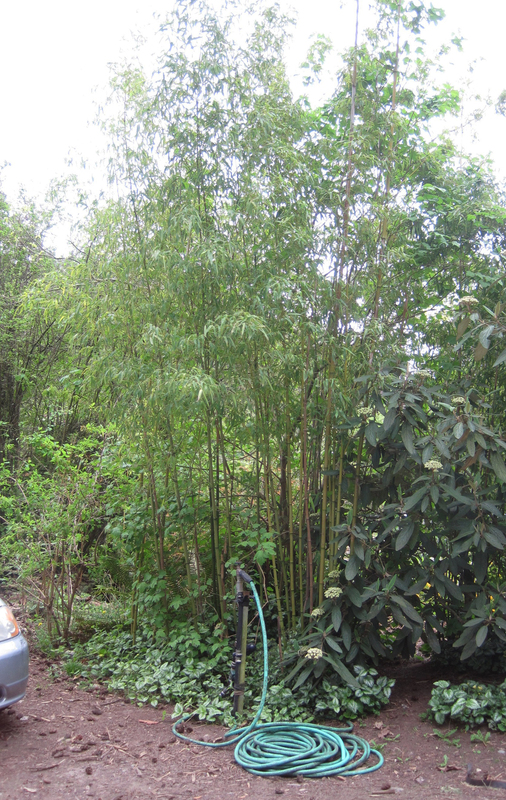 Furthermore, the “noodle” layers – the sheet mulches – impede water and air movement. They’re not needed to keep the grass from growing through. Wood chips do this just fine on their own. And don’t worry about that initial 12″ of chips. Within a few weeks it will settle to about 8″. Let it sit for several weeks. Then pull aside some of the chips and take a look. If the process is done, the grass and/or weeds will be dead and decomposing – a natural compost layer. You can then plant whatever you like. Reuse the chips somewhere else in your garden. It doesn’t look like lasagna, but it’s a heck of a lot easier and more closely mimics a natural mulch layer than lasagna does. Posted on March 30, 2011 Author Linda Chalker-ScottCategories Knock It OffTags mulch, permaculture, soil41 Comments on Is “lasagna gardening” really worth the effort? Among other things, part of my job involves reviewing educational materials for use in WSU’s Extension programs related to urban horticulture. One of the books is “Gaia’s Garden: a guide to home-scale permaculture” (T. Hemenway). It occurred to me that my review might also be of interest to our GP readers. The author, with no formal training in biology past his bachelor’s degree, states that “calling a species ‘invasive’ is not good science.” This will come as news to researchers in the field of invasion biology. He blithely disregards the real environmental and economic damage caused by invasive species and erroneously believes that invasive species selectively appear only as a result of human-caused environmental disturbance. Apparently natural disturbances (from fire, volcanic eruption, flooding, etc.) don’t open themselves up for invasion (again, a notion that is incorrect and refuted by a number of obvious examples, such as the 1988 zebra mussel invasion of Lake St. Clair and the subsequent colonization of many freshwater habitats). The author seems not to understand that there may be unfilled niches in certain ecosystems that can be exploited by invasives, endangering native species whose niches may overlap; there are obvious lessons from Hawaii, Australia, and other parts of the world. In any case, the author’s naive tolerance of invasive species is a poor example to follow and certainly not based on current, mainstream science. So, fans of permaculture, what do you think? If permaculture is a legitimate science-based practice, how do we reconcile the very real issue of invasive species? If you disagree with me, keep in mind one of the hallmarks of pseudoscience: attacking the motives or character of anyone who questions the claims. The arguments should contain content, not insults.